Biopics can either describe the life story of someone while being inventive in its storytelling (Erin Brockovich, Capote, Raging Bull) or tell someone's life story while being a bit too formulaic and not having much to offer, like The Iron Lady and this film. 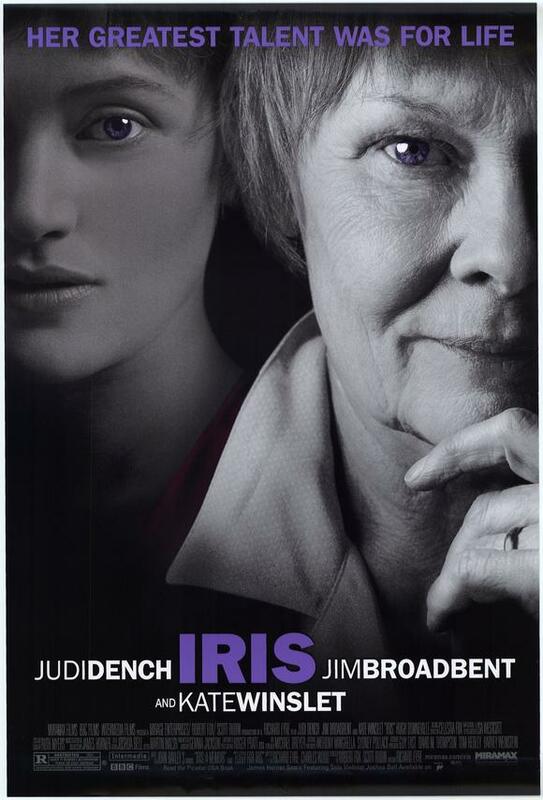 Iris follows the story of real-life author Iris Murdoch (Judi Dench) and her relationship with her husband John Bayley (Jim Broadbent). The film goes back and forth from when they first met as teachers to their later years with Iris battling Alzheimer's Disease and John becoming flustered yet devoted to helping her. The thing that I really liked about the film was the acting from the cast. Judi Dench is great because at first by the expressions of her eyes, she gives the audience a sense of what her character is about to go through. I also thought Kate Winslet, who plays a younger version of Iris, was equally as good and almost looks like a younger version of the character since she and Dench have the same hair style and colored eyes. Jim Broadbent is also brilliant as John Bayley along with Hugh Bonneville, who plays the younger John. To me, it is the actors that really make the film. While the actors are the highlight of the film, everything else.....ehh, not so much. The story is too wibbly-wobbly as it goes back and forth at random from the past to the present. In my opinion, it doesn't delve too deeply into Iris' condition and I was left wondering why John would stay with her all these years since (*spoiler alert*) Iris would be unfaithful when they were together. Plus, the film is a bit too short and even though the film is meant to focus on the relationship between Iris and John, it ends up just focusing on how awful Alzheimer's is and loses clear focus. It doesn't surprise me in the very least that it is just the actors that were recognized by the Academy. Overall, Iris is a well-acted yet incredibly messy biopic. Aside from the magnificent cast, this film doesn't really offer us anything new to the table. If you like Judi Dench or Kate Winslet or even like Jim Broadbent's work, then I would say "what the hey", but I would say you don't really need to see this.